I love looking at other people's wedding photos so I thought that I would post some of my own! Troy and I were married on July 11, 2009!! It was a beautiful wedding! Jump! I love this picture! The whole wedding party drove in red pick up trucks...no limo for this lady! Feeding each other the cake! Our Just Married sign that my mom made! Have a great day and weekend too!!! These are beautiful pictures! I'm following you back! I love all these pictures!! They are so very well done too-Kudos to the photographer! Awwwwwwww! How Sweet! I like the jump picture. It's really cute. Your dress was gorgeous. Great pictures to remember your special day! LOVE the photos...I need to scan our wedding pics...we got married Jan 2005!!! Beautiful! I love wedding pictures too. super cute train on your dress. Thank you for visiting my blog. I am now following you! Your pictures are gorgeous! Your dress was beautiful, and you were definitely a stunning bride. Congrats! Awww these are truly beautiful and Lovely! When I saw these, It reminded me of a happy ending fairy tale-Cute! 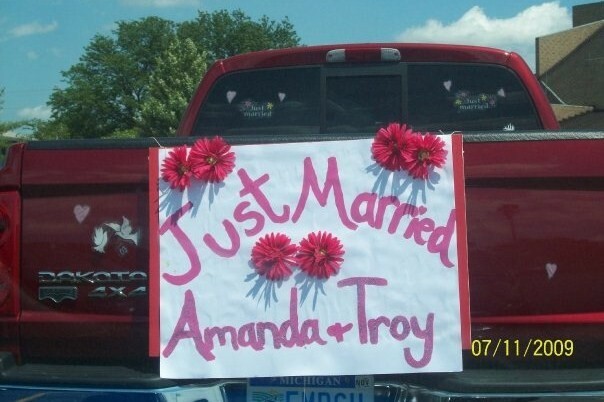 Congratulations to you and Troy you make a super cute couple and the pictures are beautiful. Thanks for stopping by my blog, I am your newest follower.